#NYFW: Happy 25th Anniversary Zang Toi! 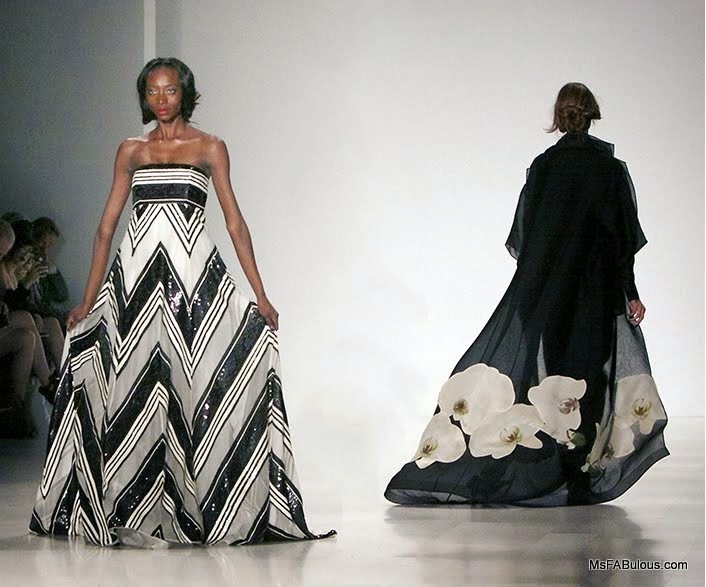 Fashion Week and photographer favorite Zang Toi celebrates 25 years in business with his Spring 2015 collection. While his longtime models and staff acknowledged the quarter century, the photographer’s pit made history with its leader, Richard Renda chasing him down the runway so the International Press Corps could sing “Happy Anniversary” while he presented him with a cake. Yes, the photographer’s pit loves Zang Toi. He is generous with his lighting checks, models who take the time to strut their stuff and pose properly. He sends out gorgeous, dramatic looks (and also lunch). While Zang Toi has often looked to exotic global locations as his inspiration, his silver anniversary collection used America as his muse. The designer told Ms. Fabulous backstage that he wanted to pay tribute to the country that embraced him. He showed day looks in his favorite color combination of black and ivory. He then used a throwback to his first collection in using bright emerald, red and purple, colors from his first season. Traditionally, Zang Toi has opened the show with day wear, then a pause before sending out the big, sweeping gowns that drive his fans wild. Separates for men and when were constructed with luxurious merino wool and silk. The designer wanted to elevate his repertoire by using crocodile skin as the base for an oversized vest. The purple ballgown portion of the show had a beautiful silk print that depicted giant blooms of orchids. There were a few styles that featured heavily beaded/jewel encrusted patterns. With the immense challenges in fashion today, it is quite an accomplishment to bring your company and staff into the third decade of Zang Toi’s success. His energy is non-stop. Waiting backstage for an interview, his personal demeanor was buzzing, happy and contagious. The photographers in the Press Corps have pledged to buy him a cake and a stellar celebration for every milestone he encounters from now on.